[prMac.com] Walnut, California - Meet Best App for Teachers - iTeacherBook 3rd Anniversary Contest! The iStudiez Team greets all teachers who are on the verge of the back-to-school season start and announces promo contest for the company's iTeacherBook App. The contest follows this year's major update of the app and celebrates its 3rd anniversary in the App Store. Share out joy and spread the word of the contest! 30 promo codes of iTeacherBook app will be distributed to the winners of the contest that started on the 16th and will end on the 27th of July, 2015. The rules of the contest were just announced on the company's Facebook page for the app. 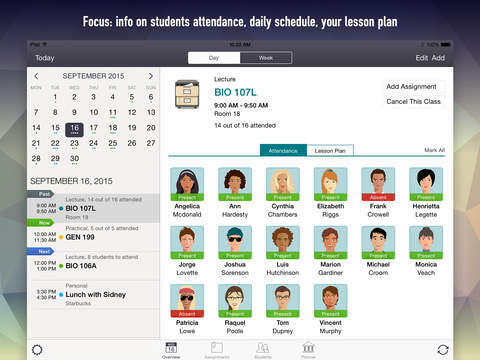 iTeacherBook is the unique multifunctional and multilingual application for teachers, which combines tracking schedule and assignments, managing students attendance and their grades, creating and editing lesson plans, in overall helping teachers to supervise the whole progress of their students. More interesting and useful features will arrive in next updates. The app allows teachers of all faculties staying much more organized and spend more time on creating new ideas for classroom, rather than wasting their time in attempts to manage their busy schedules. Developers provide 24/7 support to all users of the app and always welcome constructive feedback and suggestions. iTeacherBook is designed and developed by iStudiez Pro Team, developers of iStudiez Pro. The app is universal for iPhone and iPad and is available for download from App Store. iTeacherBook 1.2 is $4.99 USD (or equivalent amount in other currencies) and available worldwide exclusively through the App Store in the Productivity category. iStudiez Team is a developer company which designed and created educational apps iStudiez Pro and iTeacherBook. The Company was established in 2009 in Walnut, California, United States and is operating in sphere of software design and development. All Material and Software (C) Copyright 2015 iStudiez Team. All Rights Reserved. Apple, the Apple logo, iPhone, iPod and iPad are registered trademarks of Apple Inc. in the U.S. and/or other countries. Other trademarks and registered trademarks may be the property of their respective owners.